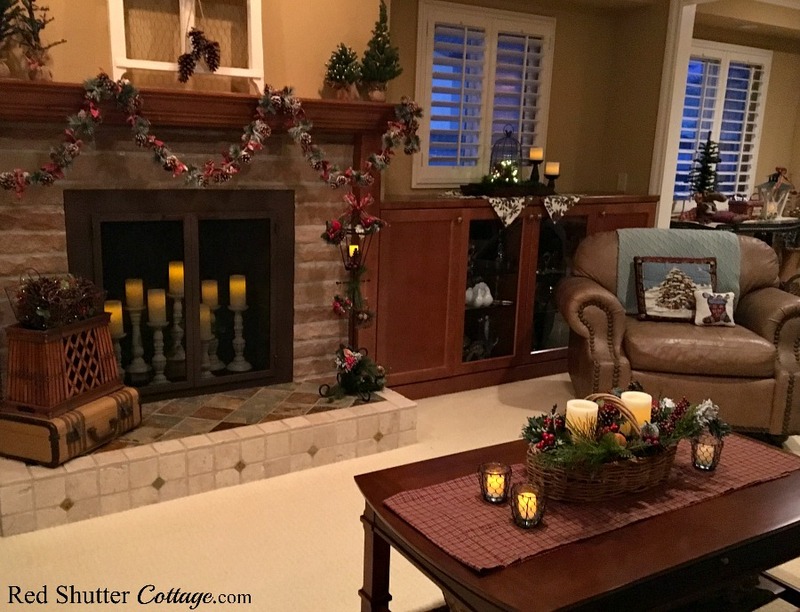 Welcome to the 2017 Christmas Home Tour at Red Shutter Cottage! 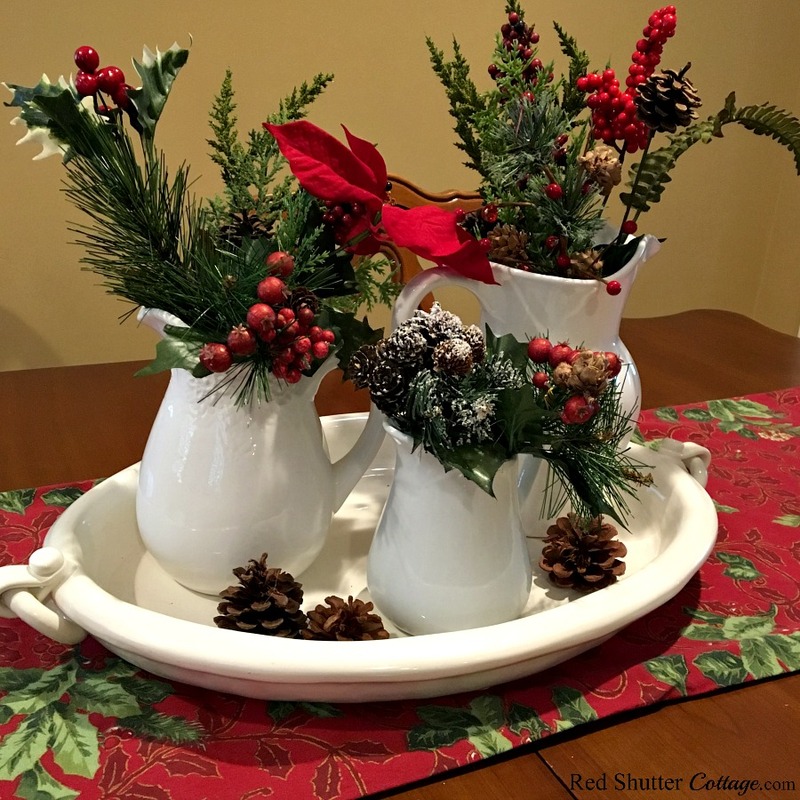 I hope you enjoy the Christmas theme I have created using a woodsy, natural approach. 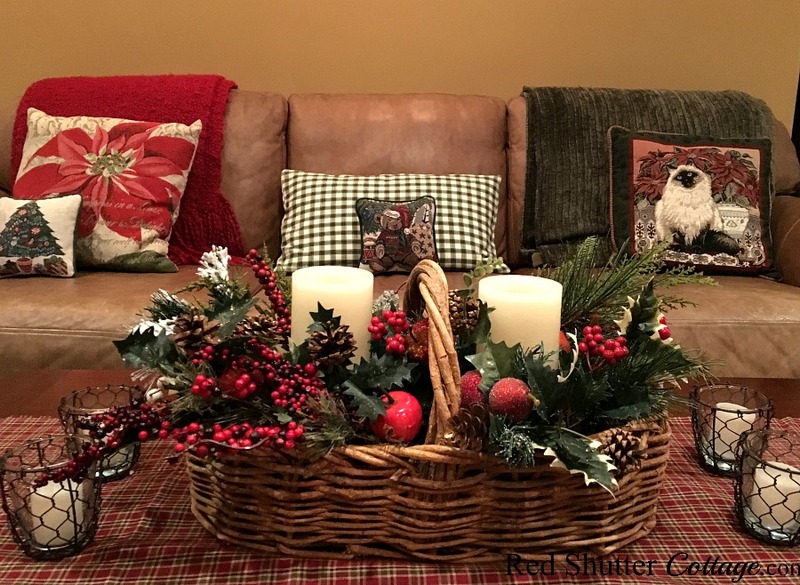 For Christmas I am drawn to natural elements, with a bit of color; pinecones, greenery, burlap and raffia, holly berries, and plaid (lots of plaid!). I also use fabrics and ribbons that add rich reds and greens (and more plaid!). 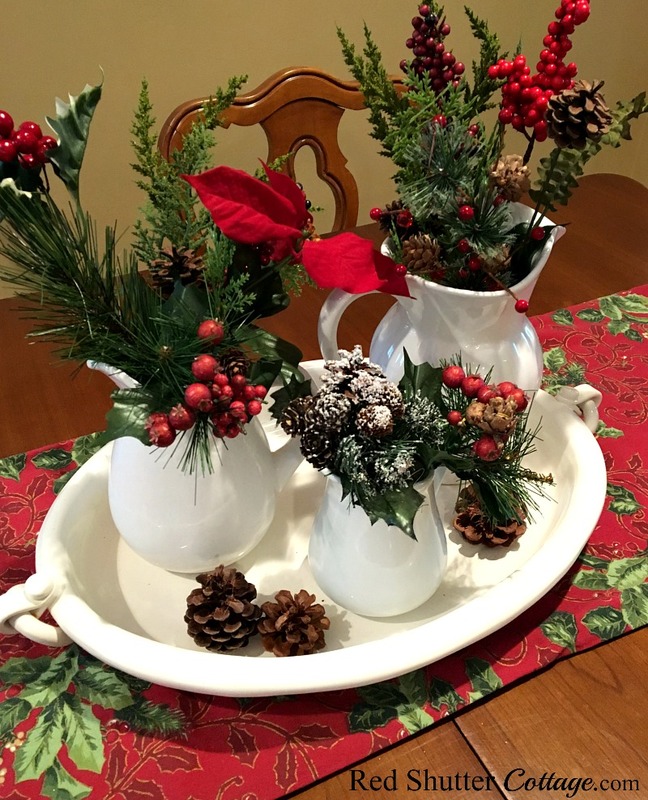 As much as possible, I also incorporate my “stock” decorating items that I use on year round basis; candleholders, white pitchers, trays, runners. a chicken wire cloche, window frames and lanterns. 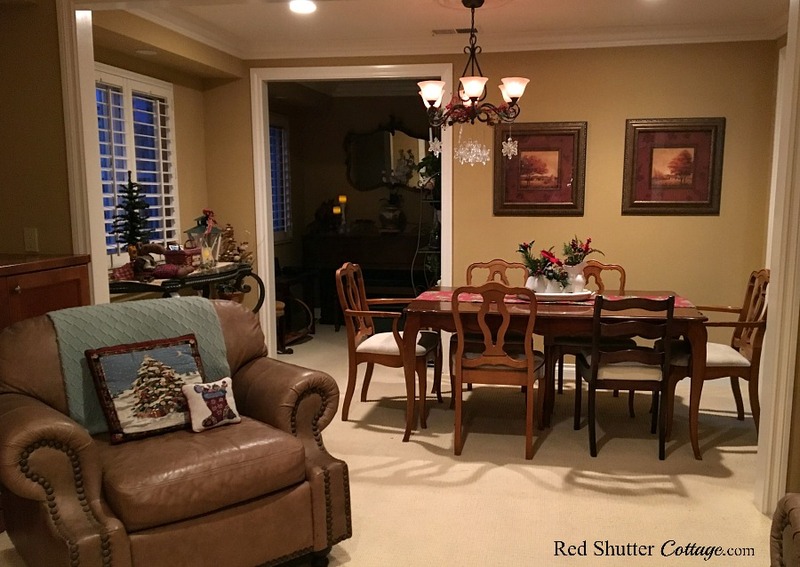 In many ways, I see Christmas as not only as a time for celebration with friends and loved ones, but also a time for retreat from the routine of daily life during the year. I see it as a time of quiet and peaceful reflection. I want our home to provide a sense of peace and tranquility, and be a welcoming refuge that is soothing and calming. 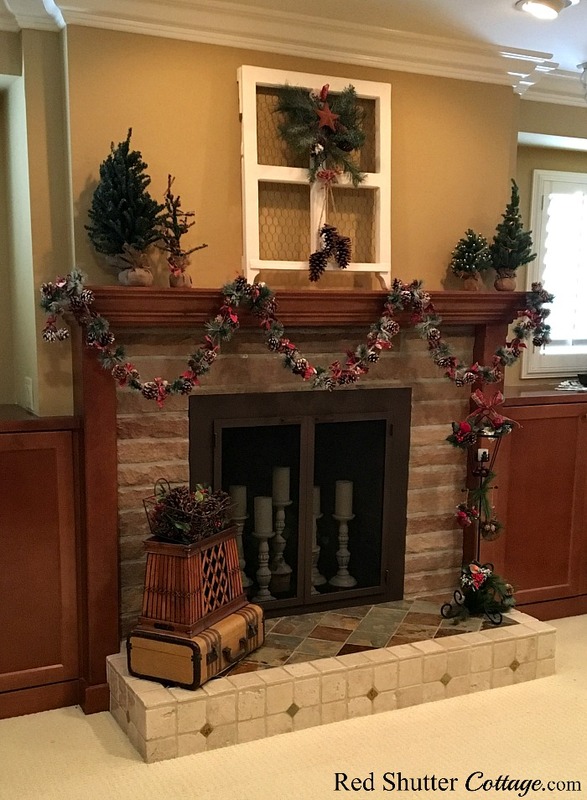 The main focal point of our living is the fireplace. I have a narrow mantel, so height is my number on priority. 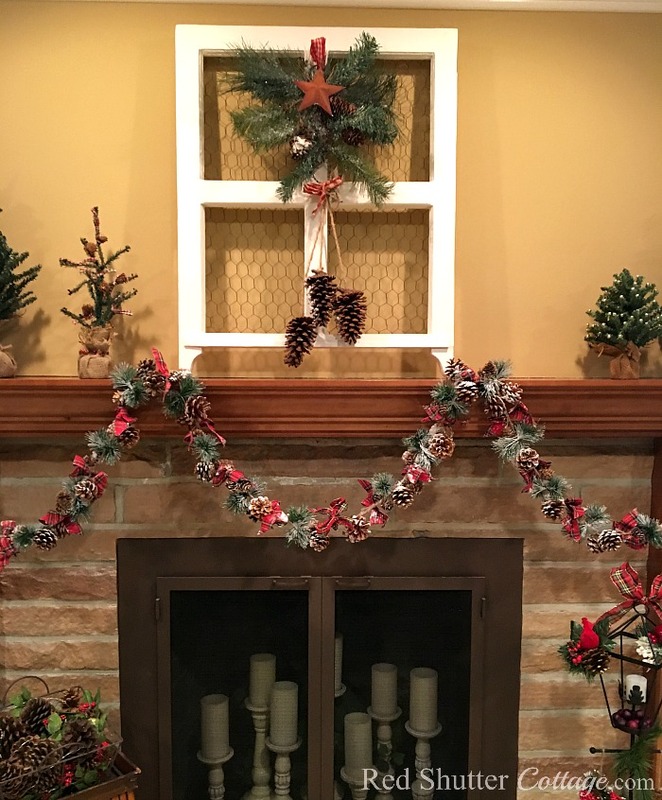 I hung a Christmas bough I bought at a crafts fair in the decorative window frame. Flanking it are a few burlap-based trees. A few weeks ago, I managed to talk Sailor into a trip to Michaels; I really just needed to stock up on a few things (like more plaid ribbon! ), not buy 3 new garlands. But of course, because I wasn’t looking, I found this beauty while casually flipping through the garland section. As soon as I saw it, I stopped in my tracks. Pinecones? Check! Greenery? Check! Plaid bows? Check! I almost felt like I had designed it myself! Simple was a key word for me in this Christmas. 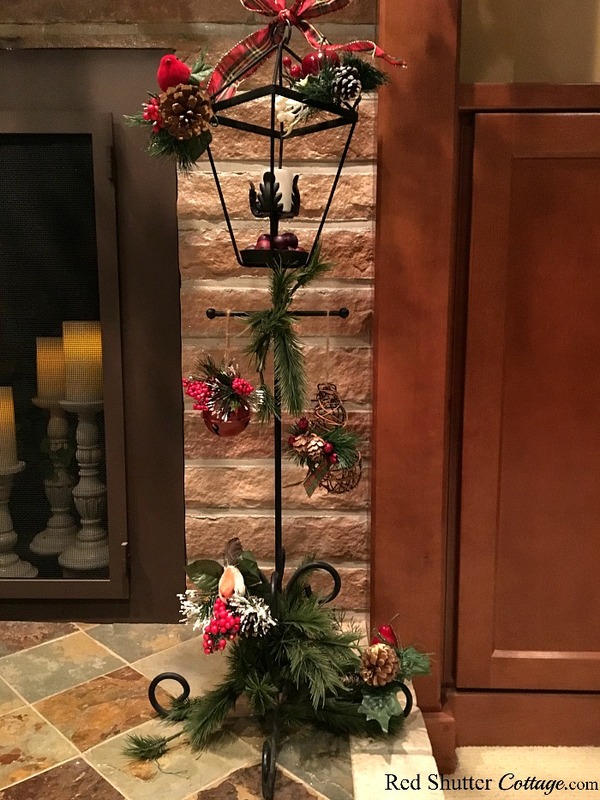 On the hearth, I combined my two “anchor pieces” (vintage suitcases and a magazine holder turned-upside-down), and added a chicken wire basket filled with dew drop lights, a garland and pinecones in it. 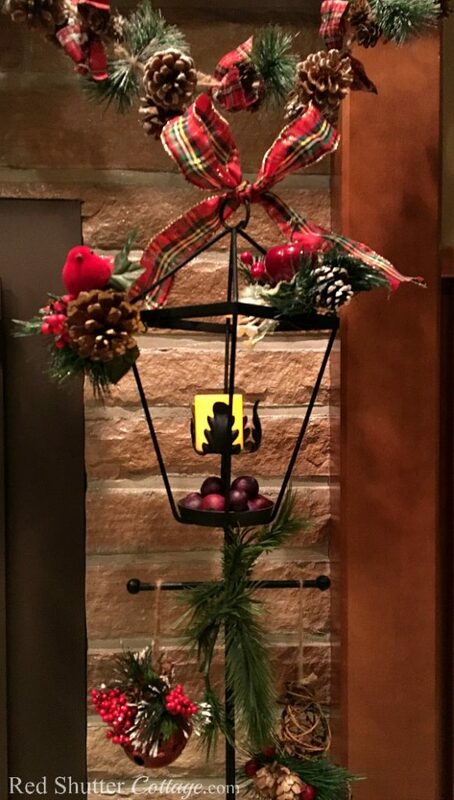 On the opposite side, I again brought out the wrought iron lamppost that was part of my mother’s Christmas decorating. 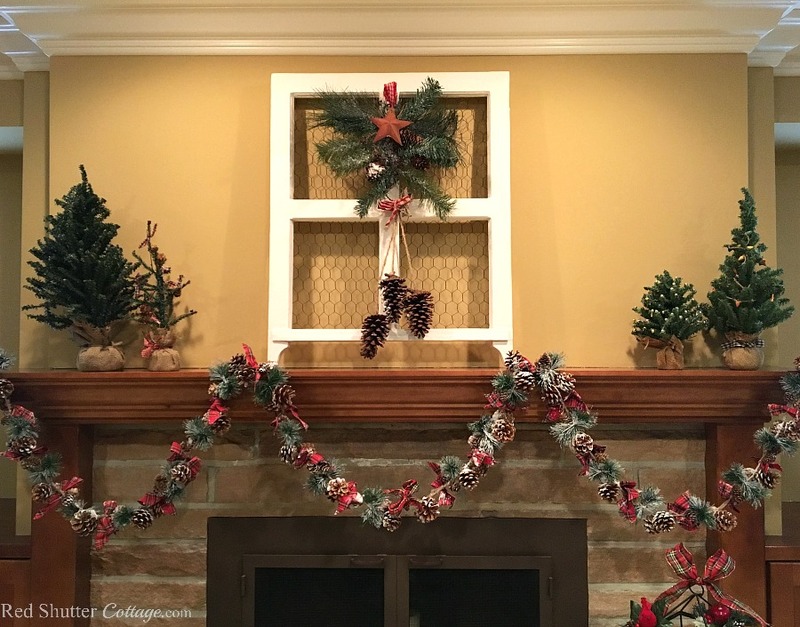 A few years ago, I removed, as much as possible, the bright green ornaments and ribbon, and accessorized it with some ‘woodsy’ Christmas picks and plaid bow. You can read about it here. 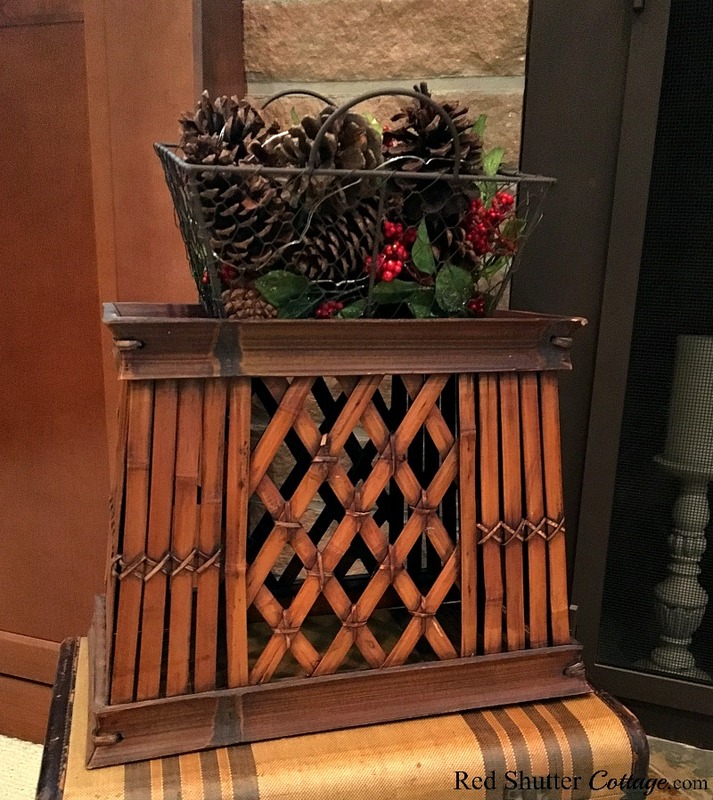 Again, keeping it simple, I filled this rustic basket (a thrift store treasure) with picks of greenery, pinecones, berries, and a few candles, and placed it on a plaid runner. The little chicken wire votive holders are from Piper Classics. 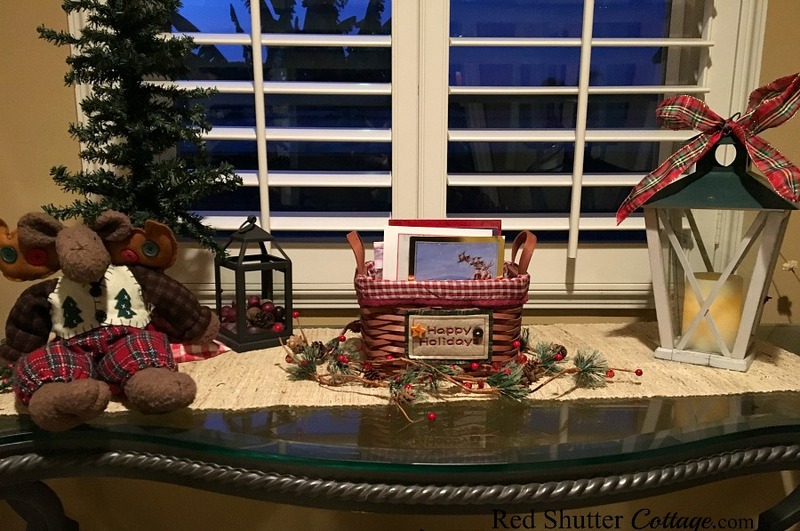 On the glass top display table that sits in our dining area, I traditionally put our basket that holds Christmas cards. This year I decided to give it a bit more focus using lanterns, a thrift shop Christmas tree, and “Morris, the Christmas Moose” (courtesy of Target many years ago). 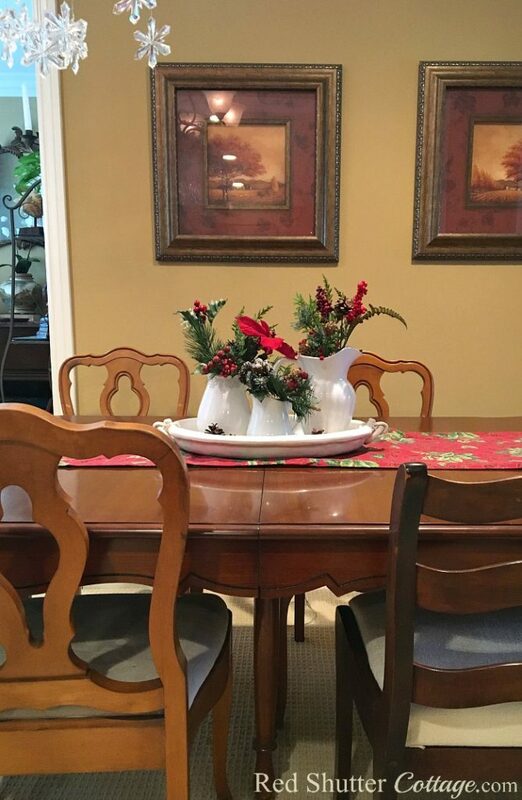 For the dining table, I wanted to incorporate some white. 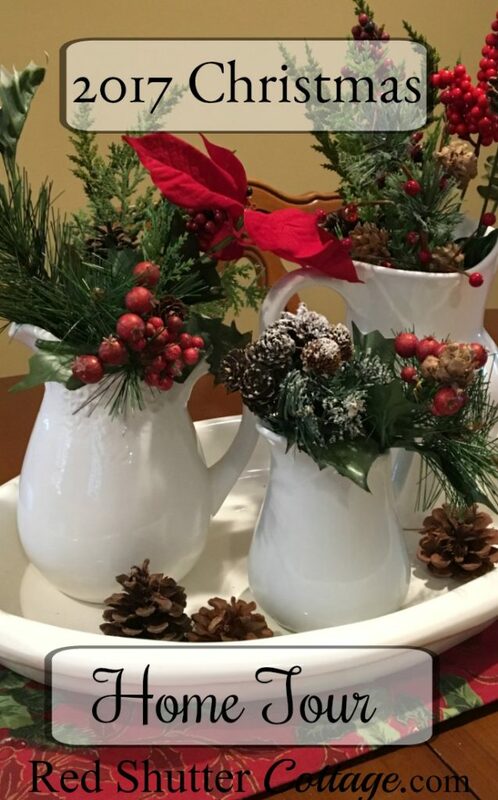 I have some pins on my Pinterest Christmas board that inspired me to build this vignette using a few of my white pitchers. (I WISH I could find ironstone in Southern California!). 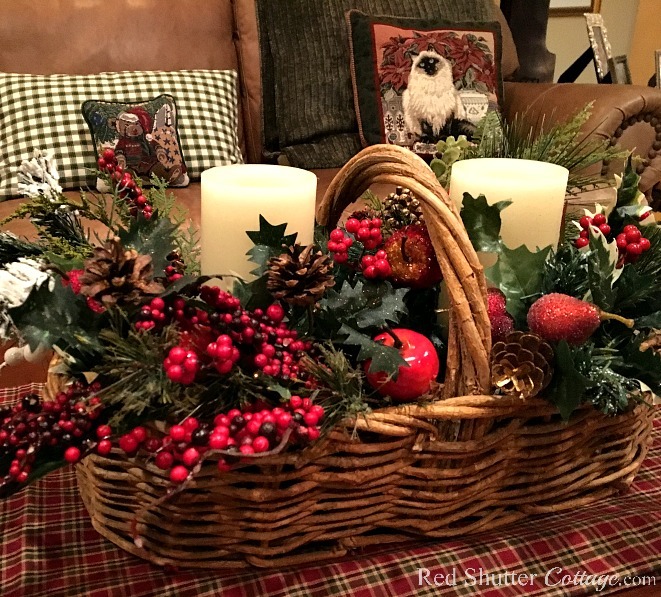 Again, I used picks of greenery, pinecones and berries, and corralled everything thing with this beautiful ceramic platter. It was a Christmas gift from Sailor a few years ago, handmade in Italy. I absolutely love it, and use it as much as I can! I wanted to share a trick with you that I learned this year. Over the years, even when I was little and trying to help with decorating the Christmas tree, I have struggled with the ornament hooks. Still, to this day, they drive me batty, and this is why: with the way ornament hooks are built, you have no control over how the ornament hangs on the Christmas tree branch. 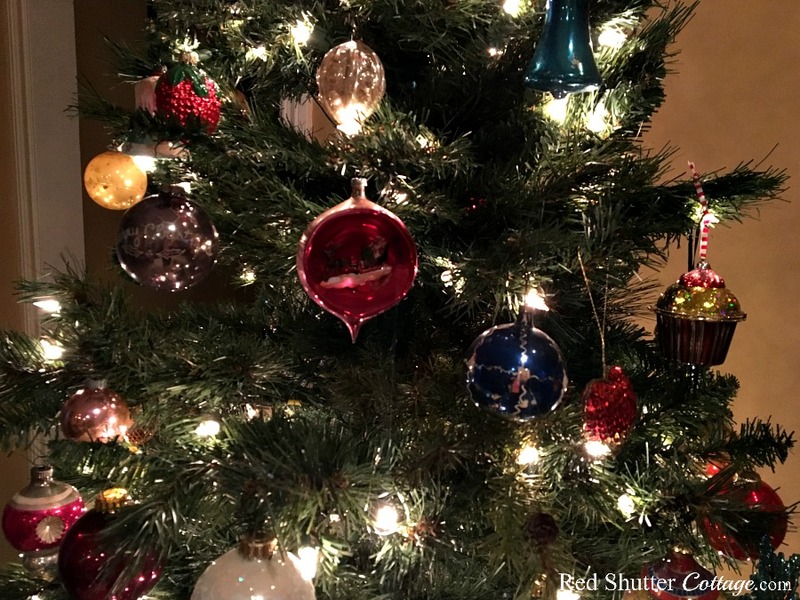 Their length often makes it impossible to hang an ornament so that it actually hangs off a branch, instead of resting on the next branch down. 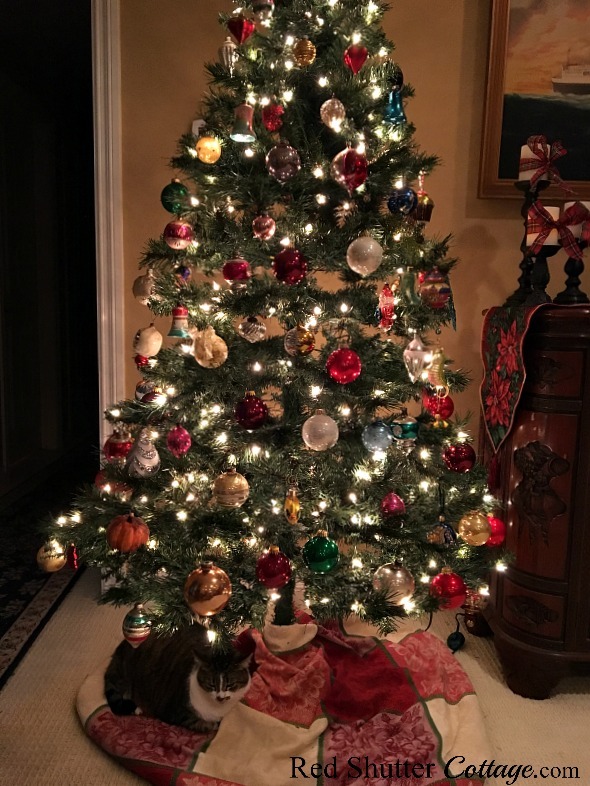 Just like you would do, I did a Pinterest search on how to decorate a Christmas tree. I came across this post on yourhomebasedmom.com. It’s a great post overall, but the best part is, I found the answer to my problem! She uses green pipe cleaners and bends them into a little circle! Brilliant! I have green florist wire, and as it turns out, it works just as well as the green pipe cleaners. I cut a piece about 3” long, run it through the top loop of the ornament, cross the ends together and bend them to wrap around into a circle form (about the size of a nickel). This sounds crazy, but it was one of those life-changing moments, in a (very!) good way. All of sudden, decorating my Christmas tree is pure joy, instead of an exercise in frustration! 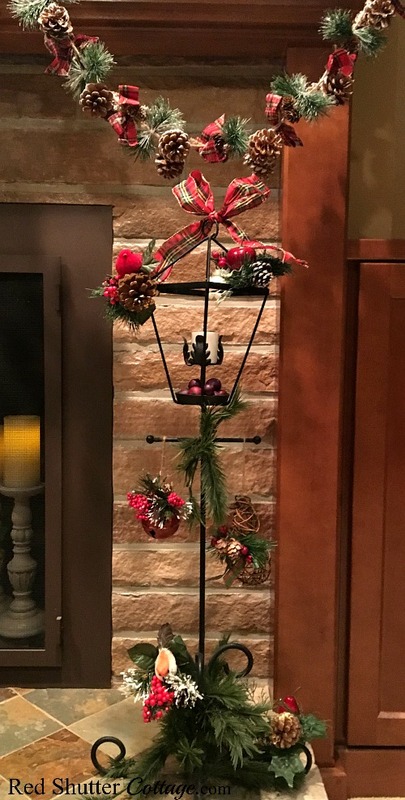 With these flexible ornament hangers, I am able to position my ornaments exactly how and where I wanted them. Combine that with the flexible branches of the Christmas tree, and my tree looks about 300% better than previous years. Not only that, I realized I had room for even more ornaments! That brings us to the end of our tour. 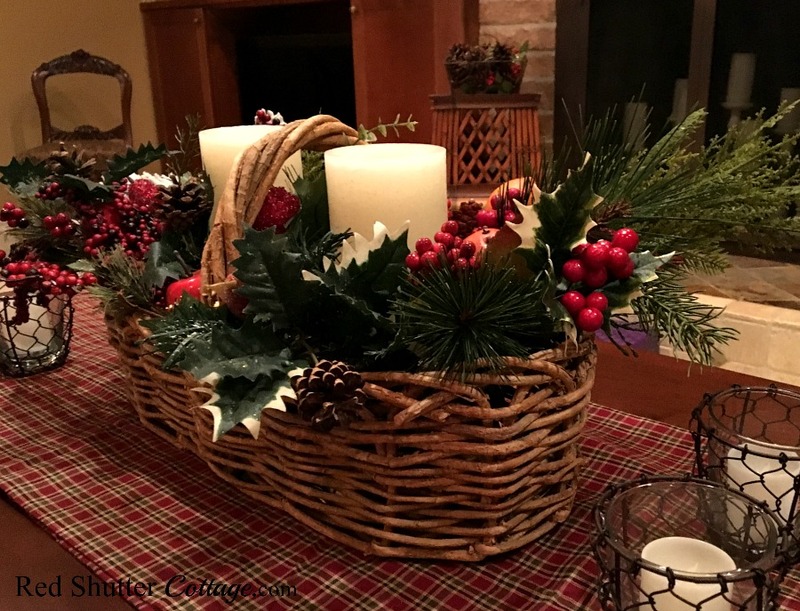 I hope you have enjoyed this perspective of a woodsy, natural Christmas look, and perhaps found something that inspires you or gives you some new ideas for your own Christmas decorating. And I really hope that my epiphany about throwing out Christmas hooks and using pipe cleaners or florist wire instead is helpful! My very best wishes to you and your family for a wonderful Christmas. 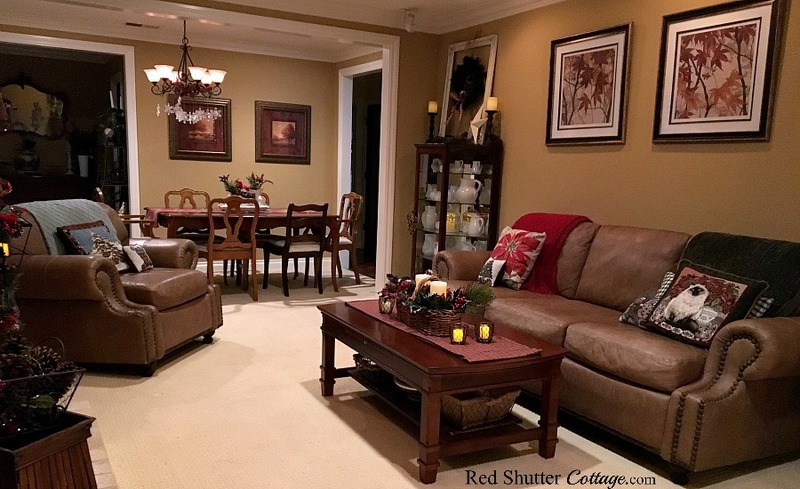 Everything about your home tour says come in and relax. It’s the kind of decor that makes you want to quietly hang out and have fun. My favorite part is the fireplace full of candles, it’s beautiful all lit up. 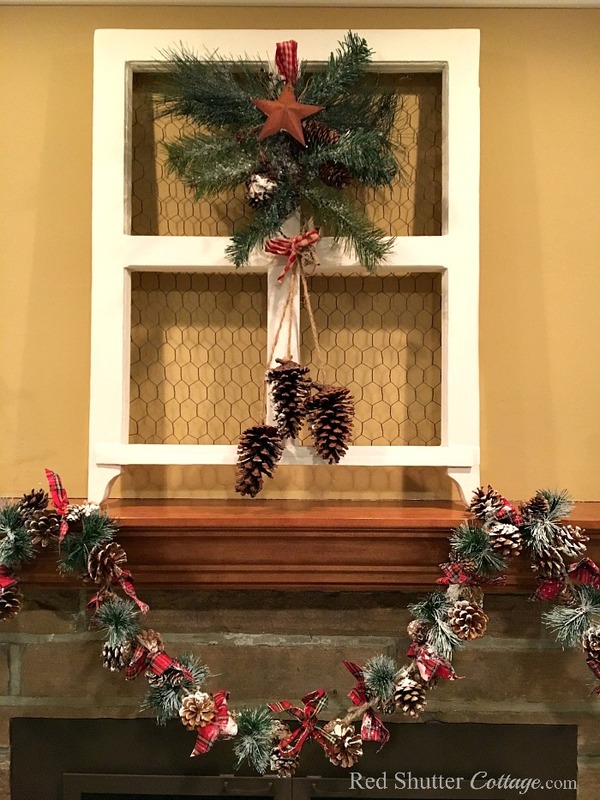 I purchase green wire ornament hangars for my tree I bet they are very similar to your florist wife. Enjoy your Christmas and I look forward to your posts in the New ea. Thank you Leanna – that is exactly the feeling I hoped to convey! Using little hoops made from florist wire to hang Christmas ornaments has been a total game changer for me! Maybe we will start a movement! Best wishes to you and your family for a wonderful 2018!